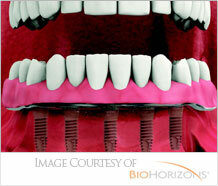 Dental implants are at the cutting-edge of tooth replacement technology. Dr. Angelo is dedicated to providing each patient with the optimal solution to their dental health challenge, which is why he often recommends dental implants. He understands that losing teeth can be a traumatic experience, so his focus is on replacing those teeth with proven, minimally-invasive techniques that allow his patients to regain maximum jaw strength. A natural appearance, and restored function. Dental implants are the modern alternative. Instead of cutting down two perfectly healthy teeth, Dr. Angelo inserts a dental implant into the jawbone to replace your missing tooth root. 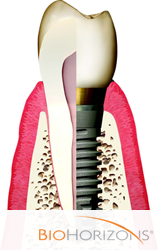 The implant becomes solidly fixed into your jaw bone (osseointegration). Your restorative dentist then places a crown onto this artificial tooth root that looks, feels, and functions like your natural tooth. Dental implants become fixed to the jawbone. Though the life span of a dental implant will vary with each patient, many have lasted for more than 50 years. With good oral hygiene and regular cleanings, dental implants should last a lifetime. For many cases and many years, it was difficult to remove a tooth root without also having to remove some jaw bone. This then called for re-growing of the bone, and caused unnecessary trauma to the jaw bone, increased healing time, and discomfort. Dr. Angelo now uses Piezosurgery techniques that help him remove tooth roots with as little trauma as possible, preserving jaw bone, and making it possible to place implant posts the same day. Dental implant treatment begins with an evaluation by your general dentist who will determine if you are a good candidate for this procedure. If they feel dental implants might be possible, they will refer you to Dr. Angelo for an examination and consultation.